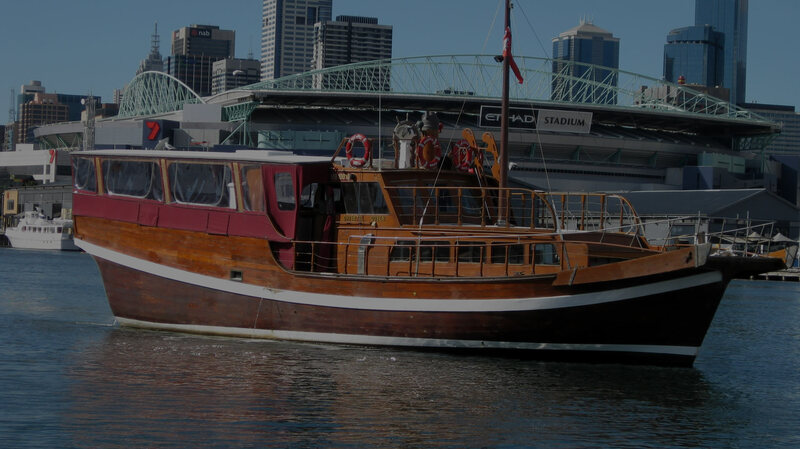 Discover the perfect party boat in Melbourne to celebrate any occasion with the unique style and unrivaled comfort of the Oriental Queen charter boat. This traditional Chinese Junk is a unique and classy venue for everything from corporate to private events of all types. If you’re looking for a Melbourne boat cruise that’s a talking point in itself, jump on board the Oriental Queen and see just what makes this private charter boat so special. Originally built in Hong Kong for an exclusive gentlemen’s club, the Oriental Queen is a 17 metre (57ft) vessel built entirely of teak. This gorgeous boat has been completely renovated with rich timbers and luxurious fabrics for a classy, comfortable boat charter perfect for celebrating any type of special event. Our Melbourne boat hire packages also feature a state of the art sound system and a licensed, fully stocked bar so your guests can enjoy the pleasures of luxury boat hire in complete comfort. Don’t settle for a small, cramped box with no character or charm when you can hire a charter boat that will impress your guests with its space, luxurious fittings and total comfort. Permanently moored at North Wharf, the Oriental Queen gives your guests the advantage of being able to come and go as they please while still being able to enjoy the beautiful views of Victoria Harbour and Docklands on offer. There is simply no other venue as unique as this in all of Melbourne! The Oriental Queen’s private boat cruises in Melbourne’s stunning harbour are well-suited to a huge range of celebrations. From a party cruise for birthdays, bucks or hens nights, Christmas and New Year’s cruises to a great location for celebrating a corporate event, our stunning boat can be transformed to give you the ambience you want. Looking for open spaces so guests can mingle and dance? Or perhaps cosy nooks for a more personal way to interact? We can ensure that our beautiful vessel is fitted out to accommodate these needs and more. Offering everything from food and drinks to décor and transfers, we can ensure the smooth running of your event from start to finish. Our friendly team can help you customise the details to bring your vision to life for a night that really impresses. Best of all, we handle the hard work so you can enjoy yourself. Whatever you’re celebrating, we want you to be in the moment, not stressed about the event management! Book an evening or day cruise in Melbourne for a beautiful experience on the water. Whether you’re celebrating something special or just doing a bit of sightseeing, you can enjoy a beautiful meal and stunning views of the city skyline, all in the comfort and luxury of your own private Melbourne charter boat cruise. Find some of our favourite ideas for private boat charters here. Whether it’s a Christmas or New Year’s cruise, birthday, anniversary or even a public holiday, there’s always a great reason to charter a boat for a Melbourne party. Day, afternoon or into the night, your guests will love this unique and fun way of celebrating anything and everything! Have a look at our great special event packages or contact us to customise your boat hire. From AFL to soccer and rugby, you can watch this season’s biggest match ups aboard the Oriental Queen for an experience that will put your local to shame. We’ll spoil you with great food and drinks while you let loose and cheer as loudly as you like in the comfort of your private party cruise. Get pumped for an awesome night – whether your team wins or loses! See the options here. A bucks party cruise or hens party cruise is the perfect way to say farewell to your single life in serious style. Our private boat cruises will give you the ultimate venue for letting loose with your friends in the comfort of a truly unique and special charter boat. With great food, drinks and entertainment all on board, you’ll love every minute. Explore our wedding cruises. Your corporate events will have style and sophistication when you host them on board the Oriental Queen. Whether you are entertaining important clients or celebrating a successful year with your team, a private boat charter is the only way to go. With incredible catering options and the stunning skyline of Melbourne at your back, you’ll understand the true meaning of class. Learn more. Help us celebrate the origin of our much loved vessel with one of our fun and delicious oriental charters. Enjoy delectable sushi or yum cha aboard this party boat as you take in the stunning views offered by Victoria Harbour. This option is great during Chinese New Year – or any time you’d like to host a themed party that embraces the beautiful Orient. See all our options here. See the Oriental Queen in Action! Previously a successful cooking school boat charter, get a glimpse at just how beautiful and versatile the Oriental Queen is by watching these videos. While no longer operating as a cooking school, our team are always eager to help you customise your boat hire for a fantastic celebration that your guests will remember for a long time to come. When your event requires that something special, a Melbourne boat cruise aboard the Oriental Queen is always the answer! Our unique vessel and incredible packages will ensure your event is designed with luxury, comfort and safety in mind. Explore all of the party cruise options we have on offer or feel free to contact us today to discuss a custom experience. We are experts in event planning and will ensure your charter is incredible from start to finish. Call today for cheap cruise deals and to book your next event!